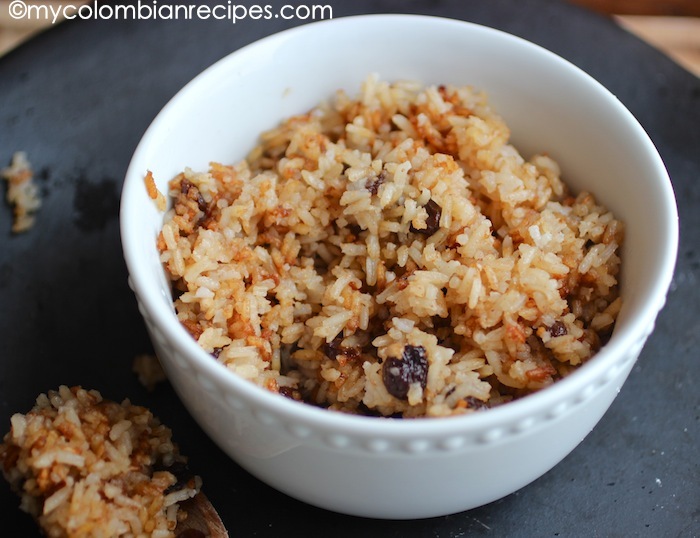 Arroz con coco y pasas is also known as Arroz con Titoté and is a traditional recipe from the Caribbean region of Colombia. We usually prepare this recipe with fresh coconut milk, but just to make it easier I used canned instead. 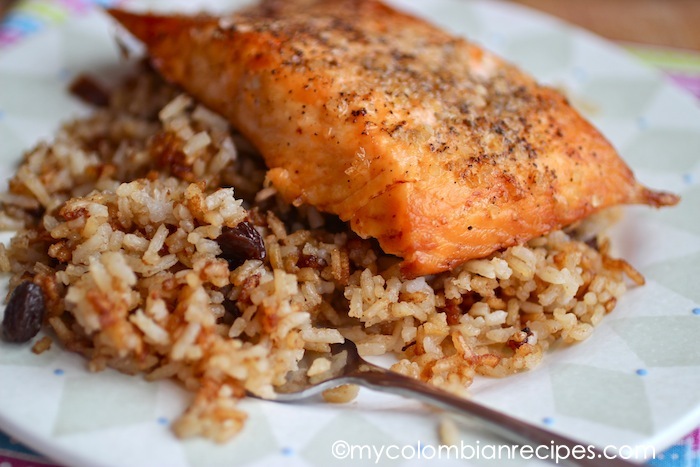 The first time I tried this rice was in a restaurant in Cartagena where it was served with fried trout and stewed yuca and was absolutely delicious. Titoté is the caramelized leavings created as a result of cooking coconut milk for about 30 minutes. In Colombia you can find the titoté in jars which makes the recipe quicker to make. Place the coconut milk in a heavy sauce pan and cook over medium heat for about 30 minutes, scraping the bottom of the pan occasionally to prevent the titoté from burning. Add the rice and cook, stirring frequently until well coated with the titoté for 1 minute. Add the water, raisins, salt and sugar. Bring to a boil, stirring once. Reduce the heat to low and simmer gently. Cover for about 20 minutes or until the rice is tender and the water absorbed. Remove from the heat and let it stand for 5 minutes. Serve hot and enjoy. The Titoté addition to the recipe makes it sound extra special. Hi! I’m glad you are back. this rie with the coconut flavor and the sweetness of raisins has to be the best! I have already post your award, thanks again! Have a great weekend! Felicidades por tu exito. Me encantan todas tus recetas! Yo soy Barranquillera, y me encanta el arroz con coco pero no siemprenes facil hacerlo o conseguir Titote. Invente mi propia receta facil y es que cualquier arroz blanco, o couscous ya cocinado, le pongo uvas pasas, aceite de coco y azucar de coco. La combinacion le da el sabor esquisito. 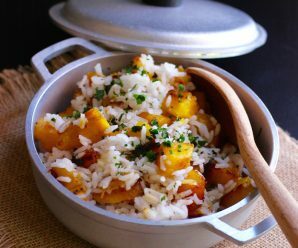 En cualquier momento que quiero combinar un pezcado o carne con un arroz con coco tengo los ingredientes al alcanze. I’m glad to visit your blog. Columbian cuisine is not what I’m familiar with. So, it’s interesting to learn about Columbian food. :) Thanks for sharing. I’m also trying to compile cheap eats places from around the world. I’d appreciate if you would share yours. Please check out my blog and click on the Fan Favorites tab. Rice Pudding! Yum! It would be new to me to have it with a savoury dish, but I can see it would work well. It’s not rice pudding. It’s more of a sweet-ish side dish that goes well with either seafood or meat dishes. 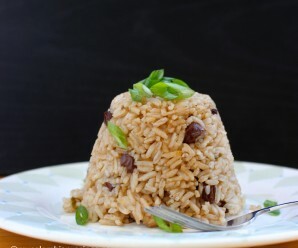 Coconut flavor rice with raisins looks delicious! Titoté preparation sounds very special! I have made a similar recipe before!! MMMMMMMMMM,…Erica! Thank you all for visiting and taking the time to leave a comment! we do this! we do this!.. but with some spices & may be nuts & we use basmati rice. 😉 how similar. I love the use of the coconut and raisins. Sounds great for summer time. Thanks everyone! 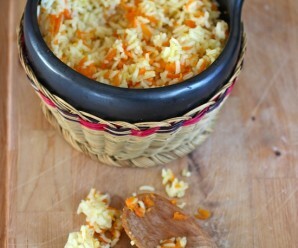 This is a delicious rice recipe. I just got from Colombia and thought this would be a great dish to make for my work holiday luncheon. I’m going to attempt to make it tomorrow…will let you know how it comes out 🙂 Thanks, Erica! I am so glad that I found you! I was born in Medellin, Colombia, but came to the states as a little girl with my mother. Mami always made amazing Colombian food… to this day, nothing makes my heart and soul happier than Colombian food. It takes me to a place that I can’t even put in words. 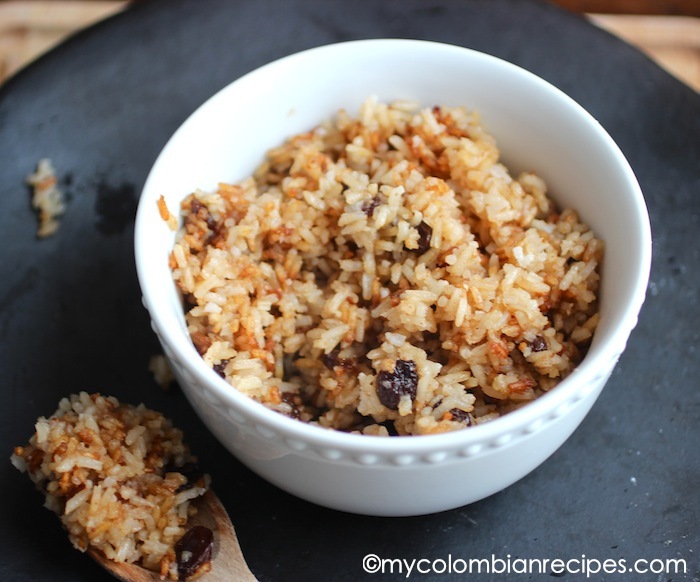 I have been craving Arroz con coco y pasas… so I super happy that I can now come to your site and get the recipe! I will have to check your site to see if you have an easy way to make mazamorra! Wish you lived in Florida! If you were my neighbor, I would be paying you to make me arepas. Arepas con chocolate y queso blanco… super rico!! Thank you for sharing your passion with all of us! Omg thank you so much for this recipe, I made it for my Colombian boyfriend and he was immediately transported to his childhood! Thanks for making me a star in the kitchen!!!!!! 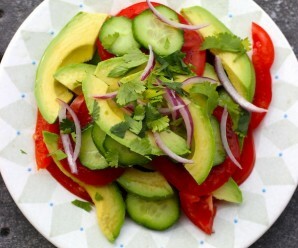 GRACIAS POR ESTA RECIPE!…. I MADE IT FOR MY FRIENDS AT WORK AND THE ALL LOVE IT!. I am writing from Tanzania. We have great recipes of coconut milk for rice, lentils, veggies, fish9sea food) and dried meat. Actually am writing a Tanzanian cook book with a base on coconut milk – the website is not yet launched. it will be an honor for me to link with Colombia and come out with a recognized International cook book. I tried making this recipe and used canned Goya Coconut Milk and it did not brown into titote. All I got was this thick white stuff. Was I supposed to use fresh water from coconut? Any suggestions. Anyway, it came out ok, a little mushy like sticky rice and a a rice pudding my Cuban father used to make. you need to keep cooking the thick white stuff on high temp…the thick white stuff will eventually turn into the brown titotes and you’ll get separation of the oil…just keep going!! If I was to use titoté from a jar how much would I use? Thanks! it took a full hour to get to the caramalized state!!!! I am marrying a Colombian man and want to surprise him with a Colombian dish. He is from Cartagena. I am going to try this with the red snapper and patacones which we Puerto Ricans call “tostones”. I will let you know. I am using your red snapper recipe as well. The recipes do not look complicated. Thank you! Sorry, I meant to ask this question in the arroz con coca-cola post.